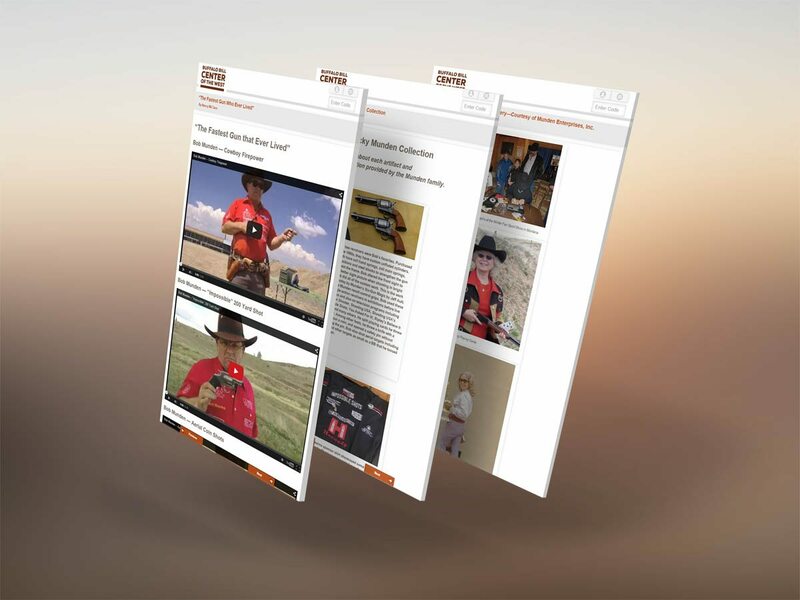 As part of its effort to develop innovative ways to engage audiences and deliver creative content beyond the physical space of its museums, the Buffalo Bill Center of the West in Cody, Wyoming, has launched a new web application called “iScout.” For visitors carrying a smartphone or tablet, iScout offers layers of additional information for selected objects and exhibits as they tour. Seth Johnson, Information Technology Technician at the Center and the developer of iScout, says, “With this technology, we can share more content about our objects, artwork, or anything else found in our museums—their images, their stories, and their deeper meaning and importance.” While including such depth of content can be impractical within the physical confines of gallery space; iScout makes it easily accessible to those interested in learning more. Onsite visitors can access iScout on a mobile device while touring the Center. Mock-up created at Static Migration. It works this way: as visitors explore the museum spaces, they find a three-digit code next to an object. By visiting http://iscout.bbcw.org and entering that code (iScout does not require downloading an app), they discover additional content such as a great photograph, an article about the object or its maker, and a short video telling a related story. And because it’s web-based, iScout is also designed for an online audience as well as visitors touring the Center in person. As Johnson says, “iScout allows us to transcend the physical limitations of gallery space to share related articles and media. The content is engaging whether or not you’re actually in our museums.” Those visiting from a distance can simply “Browse Stops” to explore the same rich content on-site visitors are accessing. Whether they’re on-site or online, users can earn badges and digital postcards to share via social media and e-mail. 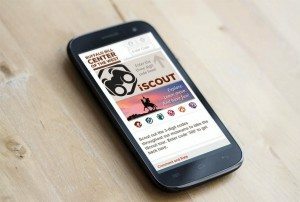 iScout takes advantage of content that’s already been created, like blog posts, photographs, videos, and virtual galleries from the Center’s online collection. For the Center’s Whitney Western Art Museum, it also incorporates an existing audio tour. In addition to objects in the galleries, iScout stops also include the summer chuckwagon, where “Cookie” Ron Reed demonstrates Dutch oven cooking, and at the Draper Natural History Museum’s live raptor program in the Center’s gardens. Additional content is layered in iScout by linking together photos, blog posts, videos, and/or virtual exhibits. Mock-up created at Graph Berry. “We have a wealth of content beyond what is found within our museum exhibits,” says Electronic Communications Manager Nancy McClure. “iScout gives us a way to deliver this additional content—created by staff from across departments in their individual areas of expertise—for those who wish to explore an object or a concept further,” she adds. “iScout helps us tell a richer story about an object or the person associated with it,” she says. Developed with staff time and a nearly-zero budget, iScout is designed to expand, as staff continue to add layers of existing content as well as create new content. On the technical level, the application can be adapted as technologies evolve, an important factor for such applications. iScout joins other projects the Center has developed over the past couple of years to expand and improve online content and interactivity, including blogging through the Center’s website, a redesigned Online Collection, and a create-your-own artwork interactive, among others. While iScout for the most part relies on visitors using their own mobile devices in the museums, or their own computer at home for on off-site experience, Cody Firearms Museum Curator Ashley Hlebinsky has incorporated tablet kiosks into a new exhibit in the gallery to offer iScout content—in a sense serving as an electronic label with layers of additional information to browse. Such adaptability makes iScout an important component in the future of interpretation at the Center. For more information on iScout visit iscout.bbcw.org and explore.